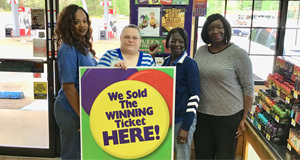 Shreveport Sales Representative Joyce Watson (right) joins Relay Station Springhill Office Helper Edrica Caldwell, General Manager Christina Hile and Cashier Marilyn Gibson to show off the store's new celebratory poster they received for selling the $375,000 winning ticket! BATON ROUGE – Bonita Baldridge of Springhill received a big surprise after hearing news that the winning ticket for the April 6 Louisiana Lottery Lotto drawing was purchased from a retailer in her area. The 66-year-old’s winning ticket matched all six numbers to win the $375,000 Lotto jackpot prize, which she claimed Wednesday at Louisiana Lottery headquarters. The winning numbers were 03-11-16-26-35-39. She also matched four of six numbers on two additional plays on her ticket to win $92. Baldridge received $266,315.32 after state and federal tax withholdings. She plans to use her winnings to pay bills and possibly purchase a new vehicle. The winning ticket was sold at Relay Station Springhill on North Arkansas Street in Springhill. The store received a one-time selling bonus of $3,750, which is 1 percent of the jackpot prize. Lottery ticket purchasers must be at least 21 years of age. Draw-style game tickets must be claimed within 180 days of the drawing. Anyone who may have a gambling problem or friends and family of anyone with a gambling problem should call toll free 1-877-770-7867 for help. For security purposes, the Lottery strongly encourages players to sign the back of their tickets immediately after purchasing. More information about Lotto and other jackpot winners can be found on the Lottery’s website, www.louisianalottery.com/lotto.